The apartment was absolutely beautiful, views are phantastic. The place was easy to find, we were greeted by the owners on arrival. Patricia took us through the whole apartment to ensure we know how everything worked. Bottle of prosecco and water on arrival. The place has everything you need to cook your own meals. Lovely outlook onto the lake from all 3 rooms. Altough you are near the highway, you cant hear the noise as the apartment is below the highway right on the lake. There is plenty of room for 4 persons. We left some clothes behind and Patricia contacted me straight away and forwarded them onto us. Patricia and Raffaello were amazing. So, so friendly and accommodating. The view from the apartment was great. Can't wait to return! Eine ganz tolle Ferienwohnung. Sehr freundliche und hilfsbereite Gastgeber. Die Wohnung ist sehr sauber und gepflegt. Toller Blick vom Balkon auf den See. Man kann sich einfach nur wohlfühlen . Gute Verkehrsanbindung mit Auto aber auch Bus. Viele Ausflugsmöglichkeiten. Wir werden bestimmt wiederkommen. Danke für eine tolle Zeit. Das deutsch sprechende Gastgeberpaar war äußerst zuvorkommend. Die Wohnung machte einen sehr sauberen Eindruck, die Möbilierung wirkte neu, in der Küche war alles vorhanden, was nötig war. Die traumhafte Lage direkt am Lago mit Sicht auf die Brissago Inseln genossen wir jedesmal auf dem Balkon. Um den wunderbaren Botanischen Garten auf der Insel zu besuchen mußte man nur zum Hafen um die Ecke gehen. Ein Bäcker ist direkt gegenüber. Auch im gepflegten Garten kann man an den Abenden ruhig sitzen und die letzten Boote und Schiffe beobachten. Mit dem versprochenen Parkplatz hat es bestens geklappt. Die dort verbrachten Tage möchten wir nicht missen ! De locatie met het fantastische uitzicht. En de directe ligging aan het meer met een mooi stukje tuin. Sehr freundliche und unkomplizierte Gastgeber. Gute Tipps für Essen. Schöne Aussucht. Gutes grosses Bett. Ruhig gelegen trotz Strasse. Verkehrstechnisch sehr gut angebunden. Wunderschöne Lage direkt am See. Von der Strasse hört man fast nichts, auch wenn sie sehr nahe ist. Es war alles da: Wäsche (auch in Bad + Küche), Reinigungsmittel, Tabs für den Geschirrspüler... Die Wohnung ist hell + modern eingerichtet und sauber. Sehr nette und zuvorkommende Gastgeber. Lock in a great price for Casa San Martino – rated 9.8 by recent guests! Casa San Martino This rating is a reflection of how the property compares to the industry standard when it comes to price, facilities and services available. It's based on a self-evaluation by the property. Use this rating to help choose your stay! Located on the shores of Lake Maggiore, Casa San Martino in Porto Ronco offers self-catering accommodations with direct lake access, free WiFi, a garden with a terrace, and free parking. The ferry dock for the Brissago Islands and Cannobbio is just 100 feet away. The apartments at Casa San Martino have a balcony overlooking the lake, a well-equipped kitchen including a Nespresso coffee machine, and satellite TV. They also feature a private bathroom and a living area. Each apartment has its own parking space and you will get your own sun beds and beach towels. A restaurant can be found within 150 feet of the property, while a supermarket is 1.2 mi away. The Porto Ronco Bus Stop, providing connections to Brissago and Locarno, is 150 feet away. Valle Maggia is located 9.3 mi from Casa San Martino and Val Verzasca is 12 mi away. The well-known market of Cannobbio in Italy is 6.2 mi away. 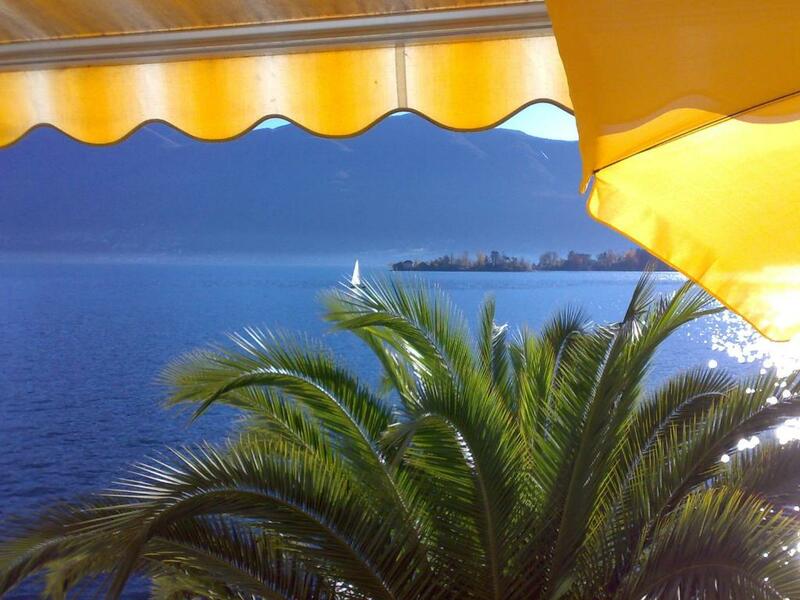 This property also has one of the top-rated locations in Ronco sopra Ascona! Guests are happier about it compared to other properties in the area. This property is also rated for the best value in Ronco sopra Ascona! Guests are getting more for their money when compared to other properties in this city. When would you like to stay at Casa San Martino? This apartment comes with a balcony with views over Lake Maggiore, a well-equipped kitchen with a Nespresso coffee machine and satellite TV, and a bathroom with a shower and a living area. Memory foam pillows, beach towels, bathrobes and toiletries are provided. All rooms have lake views. Please note further that Nespresso capsules are not provided. Guests have to bring their own. This spacious apartment comes with a balcony with views over Lake Maggiore, a well-equipped kitchen a Nespresso coffee machine and a flat-screen TV with cable channels. It also features a bathroom with a shower, and a living area. Memory foam pillows, beach towels, bathrobes and toiletries are provided. All rooms have lake views. This apartment comes with a balcony with views over Lake Maggiore, a well-equipped kitchen a Nespresso coffee machine and a flat-screen TV with cable channels. It also features a bathroom with a shower, and a living area. Memory foam pillows, beach towels, bathrobes and toiletries are provided. All rooms have lake views. Our property is lake front with a wonderful garden where our guests can relax, sip a glass of wine under our beautiful palm tree. Each apartment has its own balcony with wonderful views over lake Maggiore. Breakfast time is unforgettable, birds chirping away, ducks swimming, night time is silence broken by the waves lapping on the shore. Casa San Martino is my husband's childhood home. While our children were studying we decided to rent out our three apartments. We love the water, we enjoy boating, swimming, gardening and we absolutely adore people. We also like to travel especially during the winter as for us it is low season so much easier to get away. We are always renewing our apartments so we spend a lot of time going through brochures etc. We are friendly and open minded. Well, Porto Ronco is a small village, not much to see and do, across the road you can take the stairs and walk all the way up to Ronco, you can also walk to the Porto Ronco Beach Club where you can enjoy a spritz and at times live music. Ascona, Cannobio, you name it, take the car or the ferry boat. House Rules Casa San Martino takes special requests – add in the next step! Casa San Martino accepts these cards and reserves the right to temporarily hold an amount prior to arrival. Please note that a lower final cleaning fee applies for stays up to 2 nights. If you stay just one night and did not use the kitchen, there will be no final cleaning fee charged. Please inform Casa San Martino of your expected arrival time in advance. You can use the Special Requests box when booking, or contact the property directly using the contact details in your confirmation.